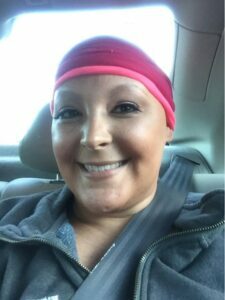 Bo, age 29 and currently fighting triple negative inflammatory breast cancer. I was 29 when I received the news that knocked me on my behind. Triple Negative, Inflammatory Breast Cancer, stage IIIC. I was newly engaged to my boyfriend of three years at the time. I had every intention of planning a wedding, but instead, I was planning how to live to make it to my wedding. I was terrified. At a young age, my dreams of becoming a mother, getting married, growing old, it all was ripped from me. I was given a 40% chance of living to five years. I don’t think I truly understood how bad IBC is, until my oncologist held my hand and said, “I’m so sorry. And DO NOT look this up online” that usually means there’s not a lot of good news about it. I am proud to say I am NED (no evidence of disease), but I live in a constant fear every day that it could come back. The thought of “will I be so lucky next time?” comes to my mind almost daily. I just want to live. We need more research funding for IBC. Too many lives are being lost to a cancer that no one talks about because it is too “rare”. It isn’t rare when it is you or someone you love going through it.